Dice roughly the large tomatoes, cucumbers, red peppers, melon and red onion and marinate with the sherry, olive oil, Tabasco, salt and pepper, refrigerate overnight. Reserve one heirloom tomato for the garnish. Next puree all marinated ingredients in a blender on high speed, until smooth texture. Season to taste with salt and pepper. Dice all the fruits and vegetables in uniformly small pieces, placing each in a large bowl after dicing. Combine in a separate small bowl, the V8 juice, oil, salt, pepper, and garlic and whisk well to blend. Add the Tabasco sauce one tablespoon at a time, to your desired heat level, whisking to mix. The soup will get hotter as it sits in the refrigerator. Pour liquid over the fruit and vegetables, and mix well, adding any additional Tabasco, seasonings, and vinegar if using, after the soup has chilled completely. Before chilling, remove 5 cups of soup from the bowl and place in large bowl of a food processor. Pulse until chunky but not completely puréed. 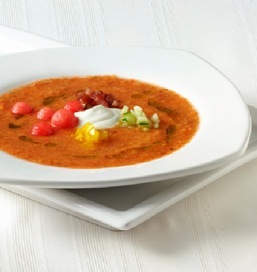 Pour soup from the food processor into the gazpacho in the bowl and chill overnight or a minimum of 6 hours, allowing flavors to blend. Before serving, taste and adjust seasonings again. Serve well chilled, garnishing with a dollop of sour cream and fresh minced parsley, or a full piece of fresh chive placed over the sour cream, if desired.